The Police do not require a reason to stop a motorist who is driving. This can also apply to anyone who is attempting to drive away. 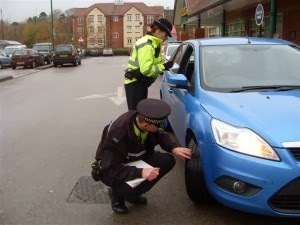 Even if you are not driving and in charge of a motor vehicle that is on the public highway, an officer has the right to ask for a routine check. If they choose, the Police can then ask you to provide your name, date of birth, insurance documents and driver’s licence details. Failure to comply with any of these requests can constitute an offence. You can see elsewhere on motoroffence.co.uk what to do if the Police subsequently ask you to come into the station for an interview. However, it is better to avoid this in the first place by undertaking simple checks that will satisfy the officer you are street legal in the first place. It is a legal requirement that your braking system performs as it is intended to, which means that there can be variations, depending on your manufacturer’s specifications. Your brakes need to be tested as part of your MoT, but they must be in good working order between these regulatory tests, too. Take the time to test your brakes on a quiet stretch of road – checking your rear view mirror before doing so. When stationary, apply the foot brake and have a friend check that your brake lights come on properly. Get a professional to overlook your system if your brakes feel spongy or the lights don’t work correctly. All tyres wear out over time. They are designed to, but different tyre compounds wear at differing rates. By law, any tyre fitted must be compatible with the others on your car. Your tyres must not show any bulges and they must not have any tears. Tread depth must be over the legal minimum which is 1.6 mm for cars. This must be maintained throughout a continuous band in the centre portion of the tyre around its entire circumference. You don't have to carry a spare but, when fitted to the vehicle after a puncture, then it must then comply with the law. Have your tyres checked by a specialist, like point-s.co.uk, if you are in doubt or you can also buy a new set of tyres from them. Most mechanics recommend that a handbrake is tested once a month. Do this by pulling away slowly and gently applying it. The car should slow. If your car starts to roll when parked on hills or the handbrake has to be applied at an angle of more than 70 percent, then you should visit a garage to get the problem corrected. Failure to do this may mean you roll backwards on hill starts, which could lead to your harming pedestrians and other road users. Without a properly applied handbrake, you may expose yourself to a charge of leaving a vehicle in a dangerous position. If your car is able to go in excess of 100 kph – and all modern cars can - then you must have a head restraint for the driver’s and passenger’s seats. It is worth adjusting them so that they will cushion your head in the event of an impact from behind. However, the law does not require the head restraints fitted are adjustable. Bear in mind, however, that slip-on style head restraints are not deemed to be lawful. Store your luggage securely in the boot with the heaviest items at the bottom. Unless the weight of the luggage you are carrying exceeds 3.5 tonnes then there is no legal requirement you need to worry about to transport it. If you go over this limit, however, you need a goods licence. When it comes to roof racks and to strapping items to the top of your vehicle, then the law promotes reasonable use. If, however, your load blocks your vision or there is a chance that it could work free and fall off, then you can expect the Police to intervene.